Construction is underway to improve drainage at Blue Limestone Park. Blue Limestone, a 16-acre city park at King Ave., is undergoing improvements this summer. 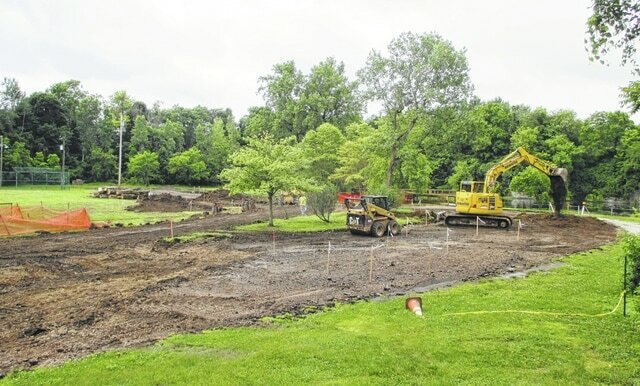 “Work is under way at Blue Limestone Park on a project that will improve how storm water filters through the soil and parking lots into the groundwater aquifer,” said the city’s Facebook page. More than 24,000 square foot of permeable concrete will be installed at the existing parking lot. City Public Utilities Director Brad Stanton has said the pervious pavement allows storm water to drain by going through layers of concrete, which treats suspended solids and filters out pollutants before the water goes into the quarry lake or Delaware Run. Since Blue Limestone receives surface water runoff containing sediments in the lake and the run, it is hoped the project will improve water quality and eliminate the need for dredging by reducing sediment by 0.3 tons per year, city officials said. The lake has year-round fishing, and the run is a tributary of the Olentangy River. According to the city, it received an $186,000 grant from the Ohio Environmental Protection Agency to make the improvements, with a match of $145,000 from the city’s Storm Water Utility Fund. “This was approved last year, but it was not done in 2014,” said Lee Yoakum, the city of Delaware’s community affairs coordinator. This week, crews have been working in the rear parking lot. At times, there will be limited access in the park until August. “The park will remain open, but be cautious of the construction that’s going on,” Yoakum said. Also at the park, pickleball courts are being constructed where the basketball court was, and may open in July. Pickleball, said to be the fastest-growing sport in the United States, is a racket sport that combines elements of badminton, tennis and ping-pong. The two new courts cost $15,000.